Here in France this time of the year is known as winter holidays among schoolkids, or winter conferences among particle physicists, which amounts to the same thing (unless you're a PhD student working 24h/day to meet the deadline). These days new experimental results pop up like mushrooms with the peak expected middle March at the Moriond conference. 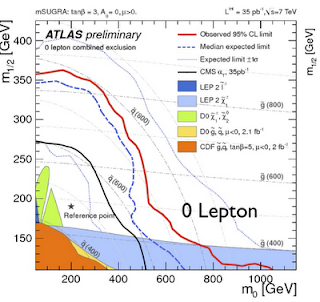 Last week new results from LHC SUSY searches were presented at the Aspen conference, both by CMS and ATLAS. The latest additions are the jets+MET search from ATLAS, and the photons+MET and dileptons+MET searches from CMS. 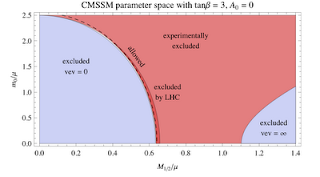 The new ATLAS search provides the current best limits on the mSUGRA parameter space Unfortunately, for the moment ATLAS and CMS present their theoretical interpretations only in this obscure and contrived way. So it might be worthwhile to discuss the physics behind the above plot and its more general consequences. At the current stage, SUSY searches are in fact searches for squarks and gluinos, the superpartners of the Standard Model quarks and gluons. That's because only superpartners carrying the QCD charge have had a chance to be produced at the LHC in reasonable quantities. With 45pb-1 of luminosity acquired so far, the LHC is sensitive to cross sections of order a picobarn. As can be read off the plot on the right, this roughly translates to a sensitivity to 600 GeV gluinos and squarks, slightly less than what you might naively guess from the mSUGRA plot. However, if squarks and gluinos have comparable masses one can profit from the squark+gluino associated production which has the largest cross section of all the production channels. The proximity of squark and gluino masses occurs in a large portion of the mSUGRA parameter space, that's why the exclusion limits extend up to 800 GeV masses in this case. Thus the production processes are relatively straightforward, it's the decay where the supersymmetric hell breaks loose. 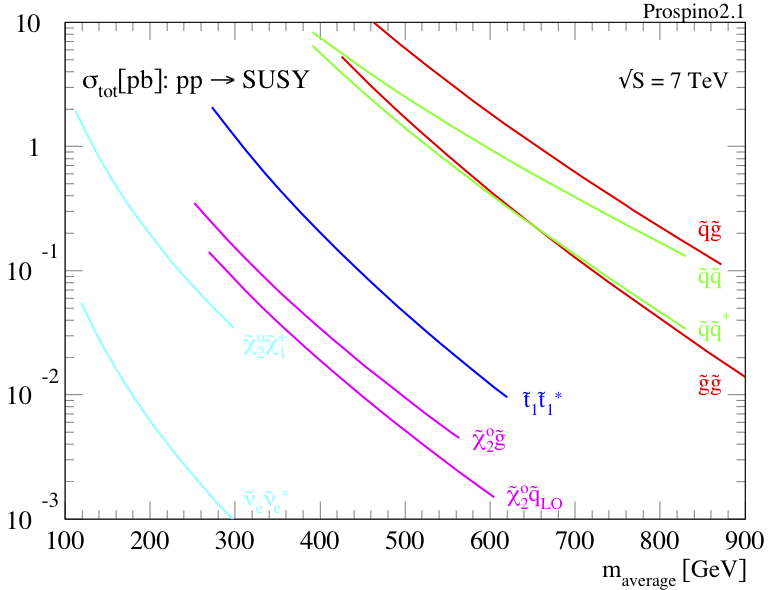 In the popular SUSY scenarios squarks and gluinos decay to the lightest superpartner, usually a neutralino, who is an electrically neutral stable particle that escapes the detector. In the simplest case, the squark decays to 1 quark + 1 neutralino, while gluino decays to 2 quarks + 1 neutralino (via an off-shell squark). 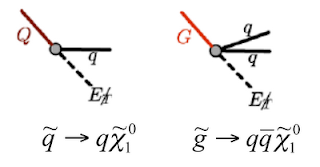 Thus the experimental signature of both squarks and gluinos is a number of energetic jets accompanied by missing energy carried off by the neutralino. This is precisely what is targeted by the jet+MET search in ATLAS and CMS, and it is the most robust signature of supersymmetry. However things can get infinitely more complicated. For example, if charginos (superpartners of W bosons and charged Higgs fields) are lighter than squarks, as is always the case in mSUGRA, a squark may choose to first decay to a chargino who then decays down the lightest neutralino. These cascade decays may spit electrons or muons on the way. Thus, ATLAS and CMS also search for jets and missing energy associated with one, two, or three leptons. This is slightly less robust, as the presence of light charginos is not guaranteed, but at the same time the leptons in the final state help to reduce the Standard Model background. 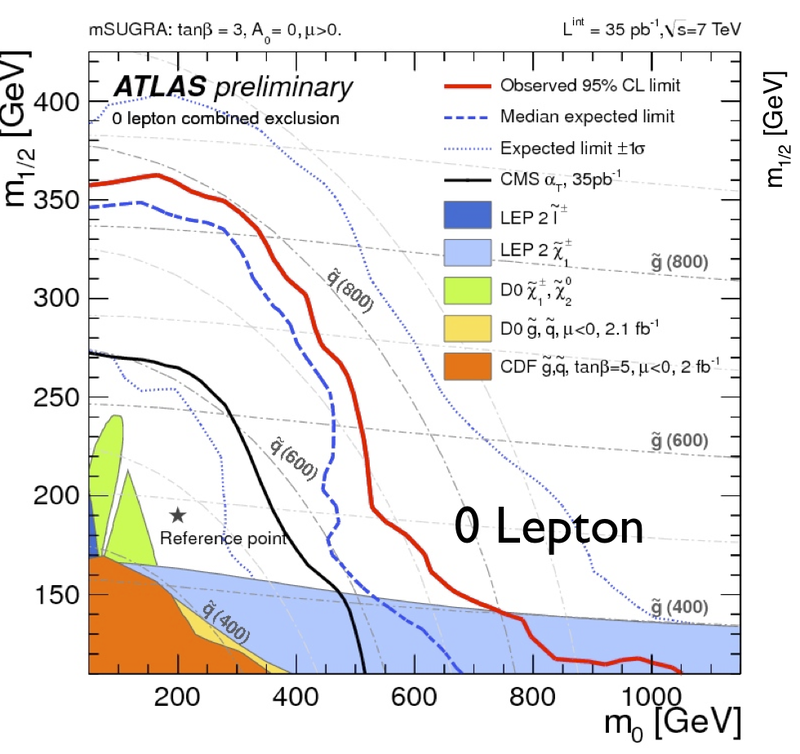 Comparing the recent ATLAS 0-lepton and 1-lepton searches one finds that the former gives slightly better limits on mSUGRA, but that might be different in other SUSY scenarios. So the cord tightens. 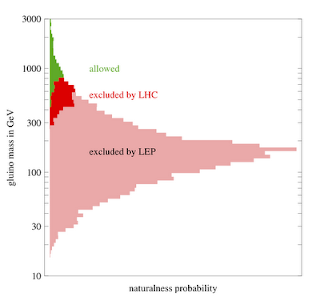 With several final states already covered, and more to appear soon, it's getting harder to avoid the stringent LHC limits in most popular SUSY scenario. Nevertheless, the possibility of sub-TeV superpartners has not been completely excluded yet. Firstly, uncolored superpartners are not constrained by the LHC. Furthermore, gluinos and/or squarks with masses 500 GeV or less are still allowed as long as the mass splitting with the lightest neutralino is small enough, such that the supersymmetric events fail the missing energy cuts. Stops, that is the scalar superpartners of the top quark, are even less constrained due to the smaller production cross section and the pesky t-tbar background. As a last resort one can turn to R-parity violating scenarios which are not constrained by the current LHC searches. If m_0 and M_1/2 are too small one cannot solve the above constraint for any μ. This corresponds to the "vev=0" region on the left-hand side of the plot. 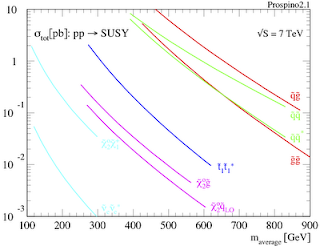 For large SUSY breaking parameters the Higgs potential may not have a stable minimum. This corresponds to the "vev = ∞" region on the right-hand side of the plot. In the remaining parameter space one can always choose μ such that the above constraint is satisfied. Nature could in principle choose one particular point in this region. Unfortunately, most of this available parameter space has already been excluded by the LEP experiment back in the 90s. The failure to observe any superpartners of the Standard Model at LEP left only a narrow sliver of the parameter space close to the "vev=0". 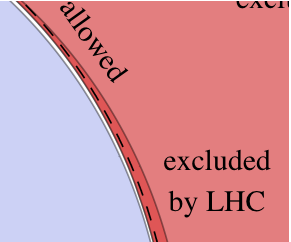 Now, the latest LHC results excluded a part of the remaining sliver, which is marked in the plot as the darker red region. Recall that blue is theoretically unavailable, light red is excluded by LEP, dark red is excluded by the LHC, and white is allowed. 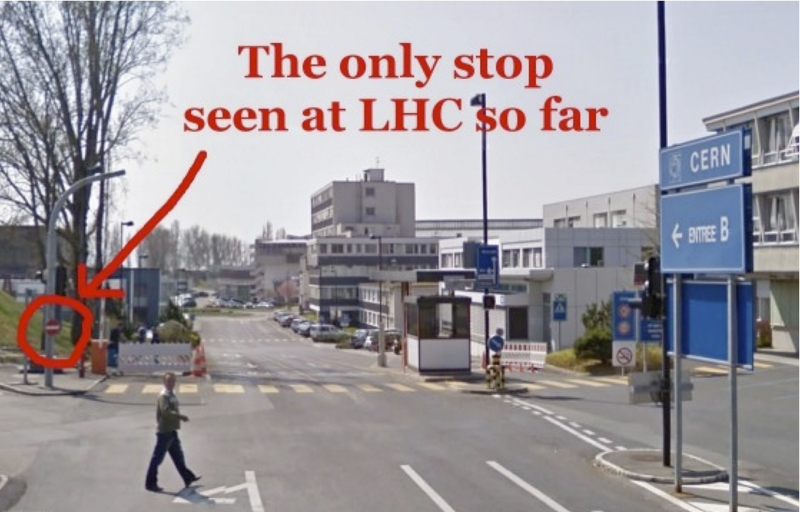 The breathtaking endeavor of the LHC for the next few years will be to further shrink the white stripe. Of course, the way it is presented here is a bit tendentious, and in a larger picture things might look less bleak. 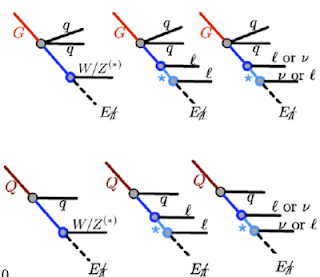 For example, the plot refers to a very specific constrained SUSY scenario; in more favorable scenarios the unexcluded parameter space may be twice as large. Furthermore, the ATLAS and to some extent also the CMS search are not completely robust. Thus, one can easily design SUSY scenarios that are less constrained by the LHC, at least for another month until Moriond. For example, SUSY models without light charginos would be missed by the ATLAS search. As a last resort, one can always present the results such that the allowed parameter space is better visible: Here, the x-axis corresponds to a relative fine-tuning of a given point in the mSUGRA parameter space: small fine-tuning on the right (when SUSY parameters are or order the Z boson mass), big fine-tuning on the left. The allowed parameter space is the green chimney close to the left edge. The breathtaking endeavor of the LHC for the next few years will be to move the red region further up the chimney. See also Alessandro's paper for more details. 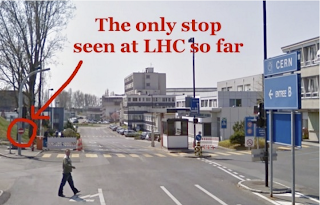 For more pedagogical and less malicious comments on LHC SUSY searches see this post on US/LHC Blog.